Chelsea have completed a deal with Dynamo Moscow which allows Alexei Smertin to return to Russia. The Premiership champions will receive a fee of £1m for the Russian international midfielder, who has spent this season on loan at Charlton. The transfer was complex due to the nature of the season-long loan but both Premiership clubs agreed to release Smertin from his obligations. The Russian skipper, 30, has signed a three-year deal with the club. Smertin had one year left on his Chelsea contract and nine weeks remaining on his loan deal at The Valley. He was hoping to play for the club in the Russian Cup on 13 March but the deal was not completed in time. His permanent move to Moscow was finalised on transfer deadline day for the new Russian league season which begins this weekend. Smertin signed for Chelsea for £3.45m in the summer of 2003 from Bordeaux, but immediately went on loan to Portsmouth for an entire season. Last season he started 19 games for Chelsea, appeared as substitute six times and scored one goal, in the Champions League against Porto at Stamford Bridge. His 16 league appearances were enough to earn a Premiership winners' medal. 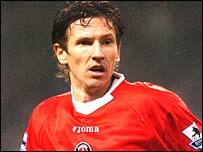 Smertin has played in 22 games for Charlton this season.